Since 1954, Fraser Concrete Contractors has been pouring and paving concrete for customers throughout Aspermont, TX and the surrounding areas. From slabs and foundations, to driveways and low water crossings, to walls and water troughs, our experience is broad, with skills that run deep. Contact us today to discuss your concrete project and to get a quote. Concrete is more than just cement, aggregate and water—it’s a gateway to possibilities. Concrete could give you the foundation for your new home, safe passage across a low water crossing or a place for your livestock to drink from. At Fraser Concrete Contractors, we shape concrete into solutions for every need! Our diverse skillset, proven history and reputation for quality work have made us the top concrete contractor in Aspermont, TX! With decades of experience pouring and paving, we’ve seen the power of concrete firsthand. Let our skilled contractors harness it to bring your projects to life! We specialize in all types of residential paving projects, including for foundations, basements, slabs, driveways, walls and much more. For ranchers, agricultural operations and more, we set ourselves apart from every other concrete company in Aspermont, TX. 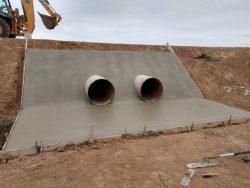 Our capabilities include concrete water troughs and storage tanks, as well as low water crossing bridges. Regardless of what we’re pouring or what the final expectations are, rest assured you’ll get concrete that’s ready to stand the test of time. We know exactly what it takes to lay durable, resilient concrete. We promise the finished result will exceed your expectations for quality and last as long as you need it to, no matter the application. See why our concrete contractors are widely respected and, for more than 65 years, we’ve been the go-to source for concrete! We’re a 3rd generation family-owned and -operated business that has been in operation for more than 65 years! We attribute our long history to our focus on excellence. Our service area is broad, covering Aspermont, TX and the surrounding 100-mile area cities and towns. We focus on residential concrete work, however our services are available to commercial customers and we welcome projects of all sizes. We have several specialties, including concrete water storage troughs and tubs, as well as low water crossings. We also do a lot of work for ranches, specifically. Our capabilities extend to just about any type of residential concrete project, including pouring for foundations, driveways, slabs and much more. Whatever your need for concrete, Fraser Concrete Contractors is ready to answer the call. Count on us for pouring and paving that’s a cut above the rest, regardless of the job. Contact us today!